I suggest that it would have made an immense difference. While I am no authority on hotel operations, $4.2 million properly applied into the Project, as intended, would very likely have made a significant difference by successfully averting foreclosure. Literally from the moment we learned that the hotel and conference center were in jeopardy of a Trustee’s Sale, the city (with the full cooperation of the local paper) shifted the spin machine into high gear. What follows will be a spin-less account with accompanying documentation of One City Plaza’s primary mission in this whole duplicitous affair – that of covering their own bureaucratic backside. The first official notice to the good folks of Yuma that there was trouble in paradise with the city’s hot-shot developer was the public Notice of Trustee’s Sale published in the local paper on Friday, June 3, 2011. On Monday, June 6th, during a personal visit to city hall this scribe was told by the city administrator, Greg Wilkinson, that the city had no knowledge of the Trustee’s Sale and that the city had been made aware of the impending foreclosure in like manner - the local paper notice. Coincidentally and interestingly, the very same day the Trustee signed the Notice of Trustee’s Sale on May 18, 2011 (here), Wilkinson submitted Ordinance No. 2011-19 (here) to the city council to amend the lease with their rapidly sinking developer. While Wilkinson may not have known on May 18th that a foreclosure was looming on the horizon for the city’s Jewell on the Colorado, he was most certainly cognizant of that problematic detail on June 13th, the day he signed the amended lease (here). Conspicuous by their absence in this suspect process is the Lender. The Lease is clear in that it cannot be modified without the Lender’s written approval (here). It begs the question, if the council approved the amending of the lease absent knowledge of the upcoming foreclosure, would it not seem reasonable for a dutiful administrator to 1) make certain that the council had that knowledge and 2) to advise the council that the city and developer had not obtained the written consent of the Lender as required by the lease and 3) to then request the council’s direction as how to proceed? No, probably not, with an administrator so utterly ignorant of the City Charter that he assumes his office is that of Chief Executive Officer (to give direction) as opposed to Chief Administrative Officer (to take direction). In an article in the Yuma Sun on the day of the foreclosure, August 18, 2011(here), Clark said he had tried to “refinance” his loan before the trustee’s sale, “but loans aren’t available to any great extent right now for hotel properties. It’s a very difficult time to refinance.” Well, yes and no. Clark wasn’t endeavoring to “save” the hotel and conference center by refinancing his loan as both he and city staff inferred. What Clark was attempting to do was to parley a deal with the new Lender for a substantial discount on the Note. As can be seen in the Quechan Tribe’s lawsuit Clark offered to purchase the loan for $12 million (for you math majors that’s less than 50% of the unpaid principal balance of $24.3 million). The Lender countered at $15 million and Clark’s in-house hotel guru, Larry Kimball, decided the offer was not in the Partnership’s best interest. (here) Folks, the Lender does not have to offer any discount whatsoever, yet Clark does not think a discount of more than $9 million is in the Partnership’s best interest? That act alone clearly demonstrates that, rather than striving to make every effort to operate a successful hotel and conference center, Clark’s “best interest” is Clark. After all, absent any documentation to the contrary, he has already personally raked in more than $4.2 million in tax dollars that were intended for the Project. Rather than being at risk of losing all of his “considerable investment” Clark’s side of the balance sheet is a net gain. The city and its high-rolling developer must have their own version of modern math since their numbers never seem to add up. For example, in the article in the Yuma Sun June 7th we were told that, “Clark invested nearly $32 million in the properties.” Come on you guys. You have already acknowledged in an open public meeting that you cannot account for whether Clark contributed one nickel into the project. Records confirm that all of the GIP has been paid directly to Clark and there is no accounting to show what he did with the $4.2 million. Clark’s alleged investment of $32 million is a curious number. The Yuma Sun article of August 18th also states that Clark’s interest in the Project is 25% and the Quechan Tribe held 75%. If, indeed, Clark invested $32 million and if that represents a 25% interest, then that would equate to a $128 million Project. Inasmuch as the building permit was for $10 million, trying to dupe us into believing that the tab for the furniture, fixtures and equipment was more than $100 million is quite a stretch. Equally peculiar is the Notice of Trustee’s Sale that states the original principal balance shown on the Note and Deed of Trust dated November 1, 2007 was $24,400,000.00 and, that the unpaid principal at the time of foreclosure on August 18, 2011 was $24,305,926.39 (here). Folks, follow this closely because it’s important. In addition to the $4.2 million in GIP there was bonus booty in the form of a 1% surcharge collected on all business activity at the hotel and conference center. It was collected along with the regular sales taxes paid to the city and was to be disbursed to Clark quarterly. As can be seen from the city’s records on August 18, 2011, the day of the foreclosure, the city cut a check for Clark’s final surcharge payment. (here) The total amount paid in surcharge payments was $78 thousand. At 1% that represents $7.8 million in business activity. Stay with me here. As can be seen in the lawsuit filed against Clark by the Quechan Tribe (here), the Quechan’s invested $4 million for its 75% share (which made it possible to obtain the loan). Clark inveigled the Quechan’s into loaning the Limited Partnership an additional $1.1 million, plus they ponied-up another $1.2 million as an added capital contribution: That’s $14.1 million. The Disposition and Development Agreement (DDA) states that the purpose of the GIP was to help “defray” the costs of the Project (here): Add the $4.2 million GIP and that brings the total to $18.3 million. Folks, more than $18 million and Clark was not making the payments? Moreover, in almost four years he had only reduced the principal on the loan by $94 thousand. It begs the question, if not toward the loan, where then did the money go? Side Note: Keep in mind the more than $18 million referenced above is in addition to the construction loan of $24.4 million. Additional Side Note: Clark, forever the manipulator, attempted to persuade the Quechan’s into converting their loan into an additional capital contribution. They wisely refused, which means that while they have lost their entire investment of $5.2 million, they can at least carry through with their lawsuit for the $1.1 million loan. Good luck with that. Clearly, when one thoroughly examines the numbers and the complete lack of accounting as to where the money went, it screams for a forensic audit. As already stated, the DDA is clear in that the specific purpose of the GIP was to help “defray” the costs of construction of the Project and city hall operatives were quick to inform us that it was “to create bridge financing” for the Project (here). In short, the money was all about the “Project.” Now, however, faced with their Foreclosed Developer being exiled from the Hotel and Conference Center and with those noble stewards of the public’s resources unable to give an accounting of the $4.2 million, their previous mantra has taken a decided turn. So, currently we are being told that the money was always intended to go to Clark, forget the Project. The way these guys can run interference they should hire out as a defensive line for the NFL. Catch the flavor of the immediate shift in the usual flow of bureaucratese coming out of One City Plaza. Presently the B. S. de jour is, “the fact that the buildings exist is prima facie evidence that the GIP went into the Project and that in itself is a sufficient accounting.” Really? The existence of the buildings is not evidence (prima facie or otherwise) of what Clark did with the GIP. Keep in mind that he assigned his interest in the GIP to a local bank that had no financing or refinancing interest in the Project whatsoever and the bank paid the money directly to Clark. The existence of the buildings may be solely due to the Quechan Tribe’s capital contributions and the proceeds from the loan. The jurisprudence challenged city attorney had this to offer, “He (Clark) was paid to build something and he built something.” For each and every economic incentive there is a specifically designated purpose and there is no provision in the Agreement to “pay” Clark for anything: Unambiguously the GIP is to be used for the Project. Assigning the GIP to a bank that had no financing or refinancing interest in the Project is clearly a breach of the Agreement and the city was a willing accessory to that breach. By allowing the assignment the city also contemporaneously allowed the GIP to be paid directly to Clark rather than the Project. With that obtuseness of contract law it is understandable that the city paid just short of a million dollars last year for outside legal counsel. Perhaps the good folks of Yuma would be better served if the city’s legal department was contracted out in its entirety. Non-Disturbance and Recognition Agreement (NDRA): The city’s evolution of rejoinders on this one would make Charles Darwin proud. One City Plaza now tells us that section 6.1 of the NDRA provides for S2 Acquisition, LLC (the Lender at the time of foreclosure) to become the Successor to the Agreement. However, in view of what we were told beforehand, this latest pretext doesn’t hold. However, inasmuch as the NDRA is a recorded document, if the city is correct and the new Lender is indeed the Successor it would seem reasonable to expect that the succession be memorialized by another recorded NDRA reflecting the new Lender (S2 Acquisition, LLC) as the Successor/Assignee. The result of a visit to the Yuma County Recorder’s office is that no such document exists. The city and developer have good reason to float the fictional notion that a NDRA was in place with the new Lender at the time of the foreclosure sale. The principal motive is clear: Without a valid NDRA with the Lender at the time of the foreclosure, then irrefutably Section 10.1(c) of the DDA (here) comes into play and the city’s Wile E. Coyote developer is undeniably in default of the Agreement. Yet, the city will continue to deny the undeniable: To do otherwise would be to admit error on their part and to admit error would be the ultimate violation of the bureaucratic code. Clark’s woes are not limited to Yuma’s Riverfront. His multiple lawsuits (here) would suggest that perhaps it is past time for the “marriage” to be annulled. Moreover, how can the city continue to do business with the equivalent of the “Music Man” (note: the legal qualification, in my opinion) in light of the grave harm he has caused to our friends and neighbors, the Quechan Tribe? If the Quechan Tribe holds a 75% interest in the Yuma Riverfront Hotel Owners, L.P and Clark holds 25%, it would be germane to know who holds the 50% interest in Clark Pivot Point, LLC and the 35% interest in Clark-Lankford, LLC (here). It would serve to either support or lay to rest the persistent rumor that former members of the city’s executive staff (responsible for bringing Clark to Yuma) are also stakeholders in Clark’s tangled web of entities. Councilman Jerry Stuart can relate to “persistent rumors,” it was the impetus that spawned his motion to conduct a $75K investigation that served no other purpose than to divide the Yuma community. The Agreement is clear in that the $4.2 million is specifically to help defray the cost of the entire project not just for the hotel and conference center and certainly not to go into the developer’s pocket. Where did the money go? The 1% Surcharge is to be used specifically toward the conference center. Where did the money go? 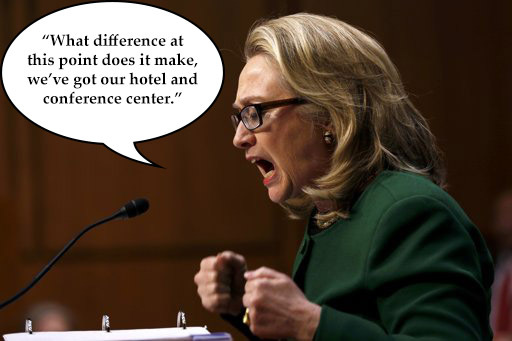 The Furniture, Fixtures and Equipment account is to be used specifically toward the hotel Where did the money go? The lease cannot be modified without the written consent of the lender. Where is the written consent? The Agreement is clear in that a foreclosure by a lender that does not have a Non-Disturbance and Recognition Agreement (NDRA) is an event of default. The city’s developer was foreclosed in a Trustee’s Sale August 18, 2011. Where is the NDRA? In its absence the foreclosure was an event of default, so why does the city continue to squander thousands of taxpayer’s dollars in needless attorney’s fees to defend its indefensible developer? Indeed, where is Councilman “We must investigate or be held as accomplices” Stuart when you need him? Footnote: Paul Johnson, the lone incumbent seeking reelection in the upcoming city elections, has been supportive of the city’s actions throughout this unmitigated sham foisted on the community. 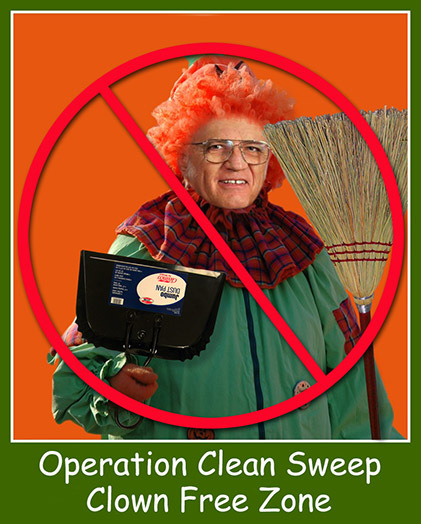 The good folks of Yuma can ill afford more of his divisive antics, it’s time for – Operation Clean Sweep.